This second article in the four-part series by Oracle ACE Director Joel Perez and Oracle ACE Associate Arturo Viveros takes an in-depth look at Cloud to Cloud Integration. The article series is directed towards IT managers and architects, particularly those who are hungry for knowledge related to cloud solutions and the dynamics involved when attempting to integrate them effectively into established business architectures. Why is Cloud to Cloud Integration such a relevant theme? Commonly, we find that organizations with flourishing cloud adoption strategies tend to address an ever-growing number of concerns through an stunning variety of cloud-based solutions, producing, as a result, highly granular and heterogeneous landscapes; this as opposed to the generally more homogenized on-premise ecosystems. And even though each one of these alternatives may begin by serving a very specific purpose, it’s usually just a matter of time before the need for interaction arises. Things move more quickly in the cloud, and those integration needs are usually pressing in the sense of leveraging cloud investments and attaining promised benefits such as flexibility, business agility, etc. Cloud integration projects, then, are definitely going to happen by necessity, but the last thing organizations want is a re-emergence of the dreaded “spaghetti architectures,” in which an array of point-to-point, custom-made interfaces are developed and deployed almost randomly, compromising with their proliferation the security, maintainability, standardization, performance and flexibility of our IT platforms: What companies ultimately desire is a modern, dynamic, reliable and (most of all) adaptable integration platform that lets them keep up with the needs of the cloud-oriented industry. Here’s where a concept such as iPaaS (Integration Platform as a Service) comes into play: an innovative alternative which nonetheless is becoming increasingly relevant. Let’s look at Gartner’s definition of iPaaS: "…a suite of cloud services enabling development, execution and governance of integration flows and connecting any combination of on premises and cloud-based processes, services, applications and data within individual or across multiple organizations"
One of the interesting quirks of a paradigm like this one is that the solution for achieving adequate integration in a cloud-to-cloud scenarios is nothing else but another cloud solution. By nature, this alternative would not require any kind of up-front investment in hardware, infrastructure or licensing, nor would it imply maintenance costs, coding, deployment or fine-tuning. Rather, organizations could get a fast start by just paying a subscription and starting to use the tool. The question is: Does Oracle’s stack offer anything that can provide such capabilities and help us effectively resolve cloud-to-cloud integration scenarios? 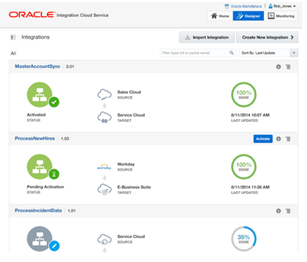 And the answer is an emphatic “Yes!” As of very recently, Oracle has joined the iPaaS ranks alongside the leading players in the cloud integration market with the launch of its Integration Cloud Service (ICS). The investment has been very strong, and has yielded a powerful, best-of-breed solution. From a technical perspective, one of the aspects that make Oracle ICS such a compelling and competitive solution is the foundation running under the curtains. Here are some of ICS’s building blocks: Read the complete article here.